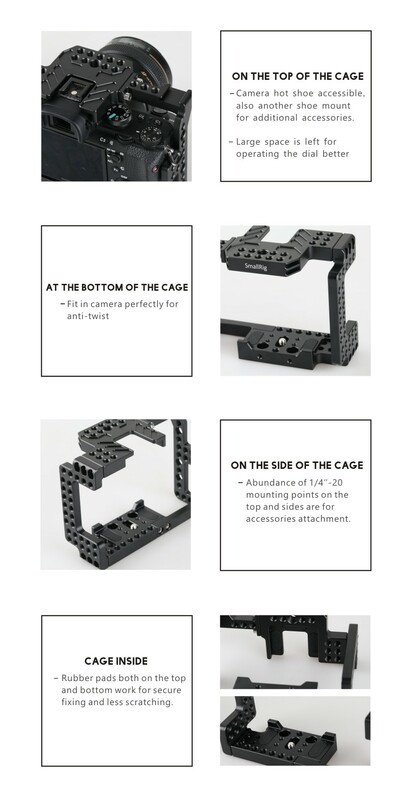 SmallRig Sony A7II/A7RII/A7SII ILCE-7M2/ILCE-7RM2/ILCE-7SM2 Cage 1660 is specially designed for Sony A7II/A7RII/A7SII ILCE-7M2 /ILCE-7RM2/ ILCE-7SM2. It is compact and lightweight. The delicate structure enables full access to the camera's buttons and controls. The top plate is equipped with arrays of mounting holes. It makes camera's hot shoe accessible, so that it can attach XLR-K1M for an external mic setup. The bracket at the right side with a shoe mount is removable. When it is removed, the remaining parts of the cage makes the camera controls exposed for easier access. The cage is equipped with mounting holes for metabones lens adapter. Meanwhile, an anti-twist bar can be attached to the baseplate to prevent your camera from twisting. Perfect protection rig for my A7RII. Mode dial access is bit limited as A7II series have a push button to rotate the mode dial.